The study of paleosols in northwestern Canada (Figure 1) in central Yukon (around Dawson City), in the Old Crow Basin reviled numerous cryogenic features, which developed in the past. On the other hand those cryogenic features studied in the Mackenzie River Delta areas are represent active processes. 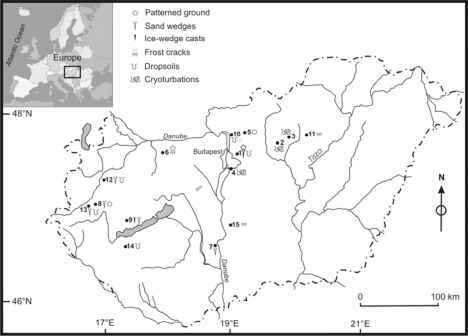 Cryogenic features were observed on a pre-Reid glaciofluvial terrace near Wounded Moose Dome about 70 km southeast of Dawson City and near the limit of Pleistocene glaciations in central Yukon . 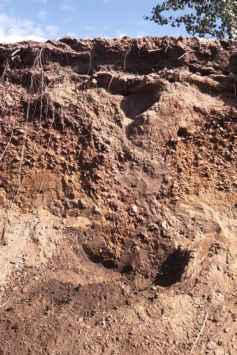 The Wounded Moose paleosols occurs extensively and fairly continuously in the Tintina Trench between Clear Creek and Flat Creek, and on level mesa-like surfaces in the Willow Hills. It also occurs sporadically on outwash terraces on the lower Klondike River and the Yukon River between the Stewart and Fortymile rivers. Most Wounded Moose soils (and also the Stirling Bend soils) display strong cryoturbation in the form of disrupted and displaced soil horizons and oriented and shattered stones [57, 64]. 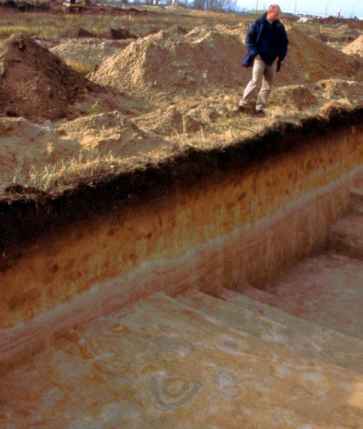 Sand wedges and sand involutions of various sizes are also common. Ventifacts are commonly found at the paleosol surface. Cryosolic paleosols were found buried within a dominantly fluvial succession overlain by Late Wisconsinan lake sediments in the Old Crow Basin. They developed in a permafrost environment and were associated with gleyed horizons, mottles, cryoturbated features, patterned ground and ice wedges. Although Cryosolic soils are common in the Old Crow Basin at the present time, the ice wedge formations found in the Old Crow paleosols (Figure 2) indicates the presence of a colder climate than now occurs. This is confirmed by the oxygen isotope record, which indicates the occurrence at that time of a cold period, which was much colder than the climate at the present time . Figure 3. Low-centered ice-wedge polygons in the Mackenzie River Delta area, Canada. Polygons and linear cracks are the most abundant cold-climate physical structures observed in the Mackenzie River Delta area (Figure 3). Polygons were identified on emergent bars located along the west side of Ellice Island, the south-west side of Pitt Island. Several adjoining low-relief polygons up to 5 m in diameter are defined by shallow cracks [cf. Fig. 7 in 23]. These features resemble the coastal polygons described by Mackay , which develop below high water level and are formed by thermal contraction in frozen ground . Recurrent freezing of water within the cracks gradually widens the crack at the surface. Linear cracks, up to ~100 m in length, bisect the vegetated bars of Pitt Island. 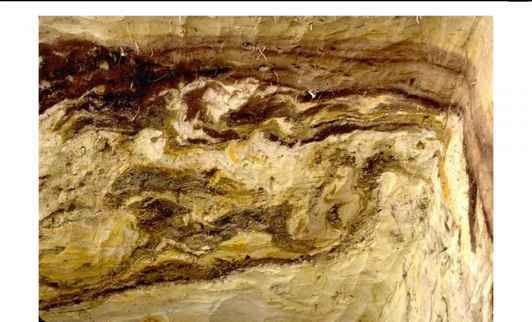 In cross-section these cracks are filled with fine sand, forming V-shaped wedges that extend to 0.5 m below the surface. 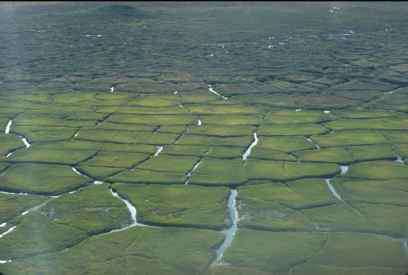 Cryosols commonly occur in the form of high-centered lowland polygon bogs, low-centered lowland polygon fens (Figure 3) and peat mound bogs . Patterned ground and cryogenic soils occur commonly in all of these permafrost regions, but their frequency and types differ somewhat from zone to zone (Table 2). Patterned ground (e.g., circles, nets and hummocks) occurs only rarely in the SPZ, but is common in the WPZ and very common in the CPZ. Ice-wedge polygons (Figures 3 and 4), a form of patterned ground, do not occur in the SPZ, but have a similar distribution to other patterned ground forms in the WPZ and CPZ. Sand wedges that have formed during the Holocene epoch (active sand wedges) occur mainly in the northern part of the CPZ. 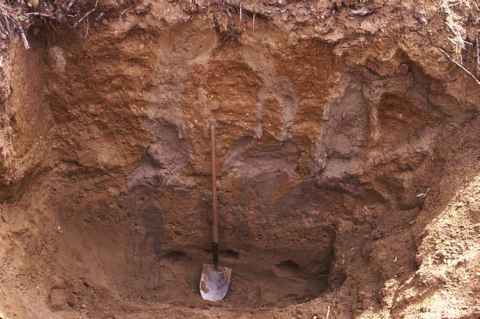 Similarly, cryoturbated soils are found only on wet, fine-textured materials in the SPZ, but they are the dominant soils in the WPZ, and the only soils in the CPZ. In the CPZ cryoturbation is even found in soils that occur on sandy materials (Figure 5). Cryosolic paleosols have well developed cryogenic features such as ice wedge casts, sand wedges, cryoturbated soil horizons and cryogenic microfabrics . Sand wedges and sand involutions also occur in both contemporary soils and paleosols in northern Canada. Figures 6 and 7 show some of these sand wedges, while Figure 5 shows sand involutions. Both of these cryogenic features developed under a cold, dry climate in a permafrost environment. 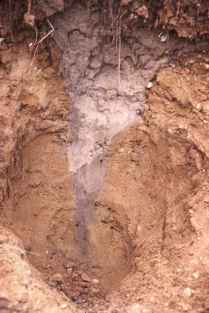 Because of the intense cold, thermal cracking occurred in the soil. These cracks then filled with sand that was shifted along the soil surface by high winds. Table 2. 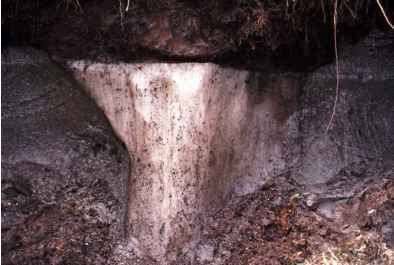 Cryogenic soil features in various permafrost zones in Canada.